Every year thousands of locals as well as tourists flock to the pilgrimage site of Lluc to worship the statue of the Black Madonna in the 17th basilica. The religious and spiritual site is the most important holy site on Mallorca. Its central location, in a valley at an altitude of 525 m in the middle of the Tramuntana mountains, is breathtaking – a place which is closely associated with nature, tranquillity, relaxation and prayer. 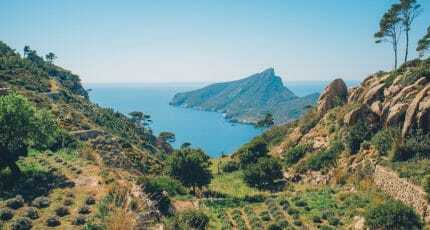 It is also popular with hikers who appreciate the good facilities here and the many hiking routes which start from Lluc such as the various stages of the Dry Stone Route and the challenging route through the Torrent de Pareis canyon to the picturesque Sa Calobra bay. The journey here by car takes you around many hairpin bends with stunning views. Along the way you will also clearly see, with the terrace formations here, how Mallorcan farmers created space for olive, almond and citrus tree cultivation. Look closely and you will probably also see the odd mountain goat climbing around the slopes. The Santuari de Lluc grounds and nearby surroundings offer several restaurants, a cafe, bakery, chemist and souvenir shop. If you are planning on spending the night here, there are several places to choose from including one of the few campsites on Mallorca. 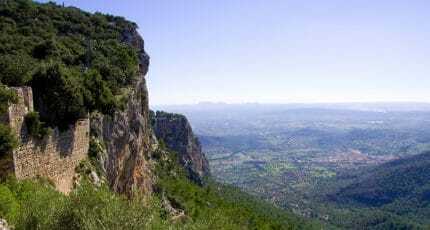 According to legend, in the years following the Reconquista, the recapture of Mallorca in 1229 by Jaume I., a young boy called Lluc found a statue of the Virgin Mary in the Tramuntana mountains. The boy took the statue to the village priest who gave it a place of honour in the church. The next day, however, the statue had, without explanation, returned to its original spot where it had been found in the mountains. The people here interpreted this “miracle” to mean that the Virgin Mary wanted to remain at exactly this spot and a small chapel was, therefore, built here which formed the origins of Santuari de Lluc. In 1962 Pope John XXIII declared the Church of Lluc, which had been built in a Renaissance style, a “Minor Basilica”, an honorary title which is granted to special churches. The Black Madonna statue, where the pilgrims head to, can be found in the main alter. Similar to Palma’s La Seu cathedral, part of the interior was also designed by Antonio Gaudí at the beginning of the 20th century. Santuari de Lluc is also home to the Blauets girls and boys’ choir which has been based here since the 16th century. The choir is known throughout Mallorca and sings in Lluc every Sunday as well as at numerous festivals and traditional celebrations for example at Easter and on Christmas Eve, at the Cant de la Sibil•la. Some of the singers also live in Lluc boarding school, although it is also possible to live at home whilst learning here. Besides the basilica there are also further sights at Santuari de Lluc such as a museum which includes collections on various subjects (archaeological finds, Mallorcan culture, ceramics and art) and the botanical garden which has more than 200 indigenous plants. Families, meanwhile, particularly enjoy the playgrounds and recreational area and there are barbecues, firepits for open fires (although no fires or barbecues between May and September due to risk of wildfires), tables, water (also from a natural mountain spring) and toilets (including for disabled) here. 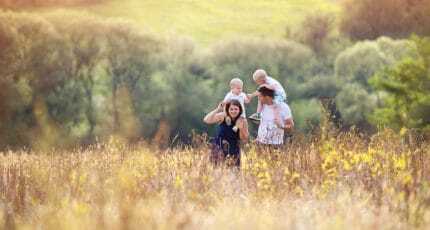 There are two playgrounds for children – one for younger and one for older children. Many good hikes start from Santuari de Lluc. A short, 20-30-minute walk, for example, will take you to Monte del Rosario which offers marvellous views of Lluc valley and Aubarca. If you want to do the GR 221 Dry Stone Route, you can either set off heading south west, towards the Tossals Verd hostel by the Cúber reservoir, which is a difficult 5-hour hike, or north east to the Pont Roma hostel in Pollensa. 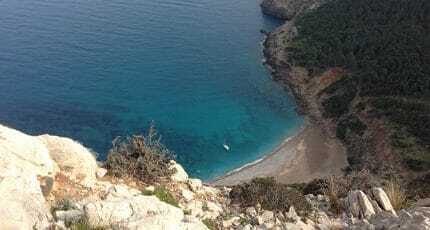 One of the most challenging but also stunning hikes, which is best done in a group and with a guide, leads through the Pareis canyon to Sa Calobra bay. Not quite as difficult and well suited for families, meanwhile, is the two-and-a-half-hour hike along the Cami Vell de Lluc which leads to Caimari. 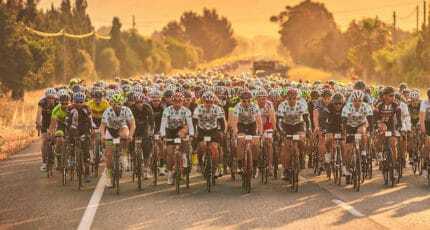 The quiet (little traffic) challenging mountain roads here are also great practice terrain for cyclists and it is therefore hardly surprising that Mallorca’s most important cycling competition, the Mallorca 312, passes Lluc. 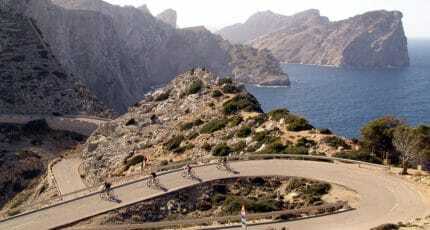 This cycle route is also part of the “Master route”, as former cycling pro Max Hürzeler once described it, which continues to Puig Mayor, Mallorca’s highest mountain and up to Sóller. There is also a large covered area on the Santuari de Lluc grounds for meetings and events. This offers space for 4,000 people and is usually used for religious or spiritual events. The refuge Son Amer is ideal for hikers who can use it as a base for various hikes along the Dry Stone Route. It is a 15 minute walk away from Santuari de Lluc. It can be quite difficult to get a space here in the quiet season – spring and autumn – as this is when most hikers come to the area. In the hot summer months, in contrast, it is often quiet. There is also accommodation with 81 rooms and 39 apartments on the Santuari de Lluc grounds. The rooms here have a bath, television and heating. Alongside these options, Santuari de Lluc also has two campsites. The biggest and best-known event is the Marxa des Güell a Lluc a Peu, the most spectacular hike and pilgrimage on the whole island. Every August, more than 10,000 people walk the 50 km from Palma to Lluc in one go! 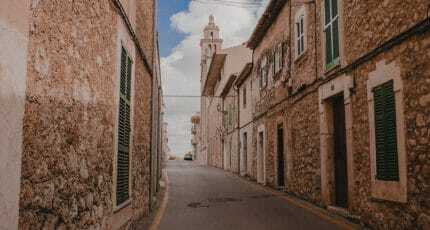 The starting shot is fired at 10.00 pm on the Calle Aragón in Palma and most pilgrims arrive at Santuari de Lluc the next morning, around 10 or 11 hours later. Walkers are provided with water, fruit and coffee along the way. In 2018 the hike was cancelled for the first time in its 43-year history. According to the event organiser, the government had not provided the required financial resources on time. 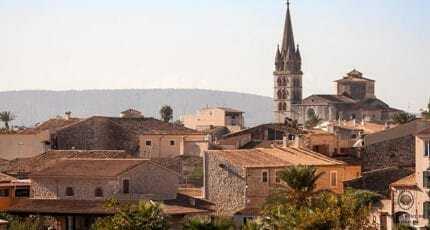 The festivities honouring the Virgin of Lluc, the patron saint of Mallorca, are held on 12 September. 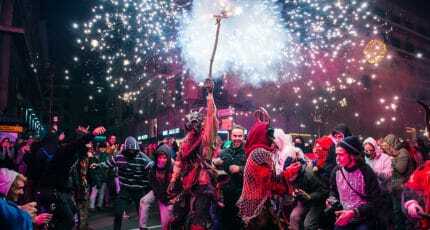 On this day, the Blauets sing in Santuari de Lluc and there is a procession with children holding lanterns as well as dancing and delicious local specialities. Caimari in south Lluc is the nearest village which may on first glance appear rather non-descript. Yet Caimari is well known for its olive oil production and the olive festival which is held here every year. There are seven idyllic country and village hotels in the area around Caimari which have joined together under the name SOM7. Gourmet diners in search of a true culinary highlight, should head to the Restaurant Ca Na Toneta. 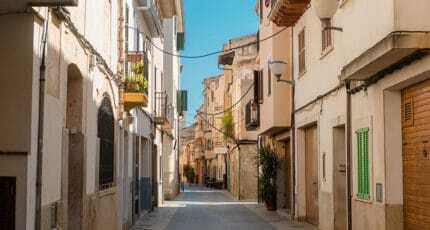 Two towns which are not far from Santuari de Lluc and well worth a visit are Inca and Sa Pobla. Inca is well known for its leather and shoe production and the Dijous Bo, an annual folk festival, which attracts the whole of Mallorca. Sa Pobla, on the other hand, is known for its delicious agricultural products, above all the humble potato. 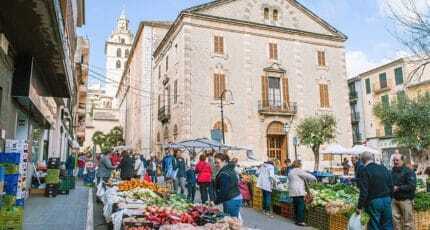 Recommended highlights here include the weekly market in Sa Pobla and the annual festival honouring the potato – the Fira de la Patata. Sa Calobra is certainly one of the most beautiful bays if not the most beautiful in Mallorca. The descent down here has many hairpin bends and is very popular with cyclists with stunning views of Mallorca’s rugged mountain landscape. The bay and beach are very busy, particularly in the main season and, in the summer, it can get quite full. A recommended alternative is the equally beautiful neighbouring beach of Cala Tuent. We hope you found this article about Santuari de Lluc useful and that you discover new and amazing places as a result of our recommendations. 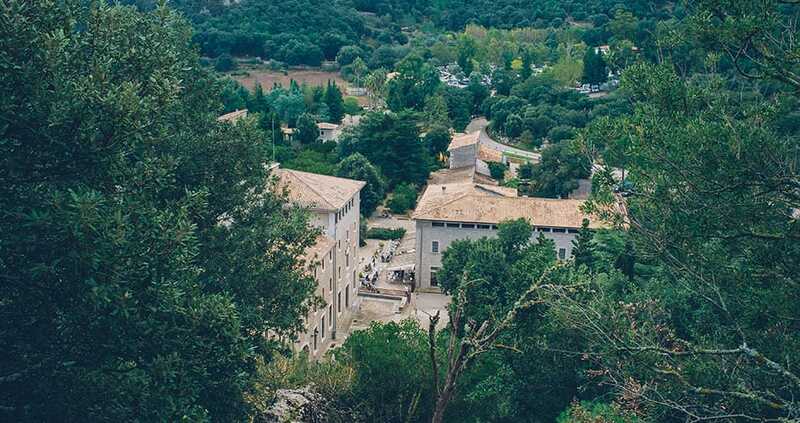 We hope you have found this article about the Santuari de Lluc useful and that you have many memorable stays in Mallorca as a result of our recommendations.